Soft power has attracted significant attention in scholarly and public debates on foreign affairs in recent years. Notwithstanding this greater attention, the treatment of soft power has developed little beyond “soft theory. 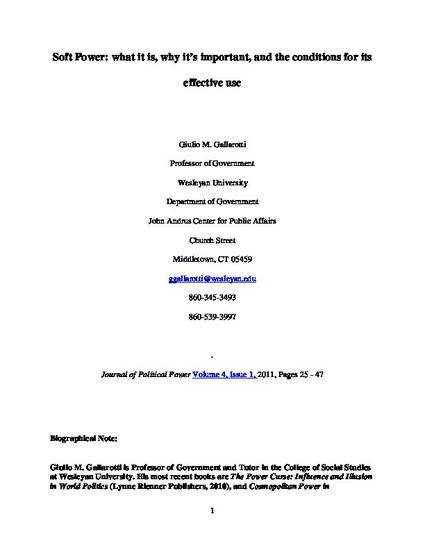 ” This article addresses this deficiency by offering a more rigorous and systematic analysis of the process of soft power. In addition, it seeks to address two further shortcomings in the treatment of soft power: by explaining how changes in modern world politics have raised the value of soft power, and by proposing conditions that encourage decisionmakers to appreciate and effectively employ soft power strategies.